A Guide to Understanding an Afghan Woman’s Role in Her Society. The curriculum is based on the personal knowledge of the Afghan instructors at the DCLCP, all of whom have experienced the social and cultural changes in Afghanistan during three decades of war and poverty. It reflects their and their family’s experiences both in the rural and urban settings. 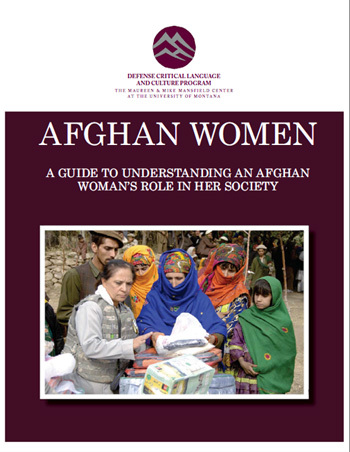 The booklet is in no way meant to represent all the experiences of Afghan women, but only to serve as a guide to assist US military personnel when interacting with Afghan women. The sole purpose of this training material is to help build better relations between Afghans and the US military.